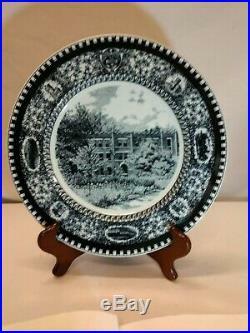 Culver Military Academy Shenango Plates - Black. Created in 1932, a set of 12 plates were designed to commemorate the Culver Military Academy by Shenango Pottery. This listing is for one of the twelve plates: This plate commemorates The South Barracks. The plate is in near mint condition with no signs of use and some very light surface wear. This piece has been used for display only. I have ten Culver Military Academy plates for sale. History of this collection from Maxinkuckee Historys Website/Bob Hartman. The first became available during June Week of 1932 were produced by the Shenango Company in New Castle, Penn. Whose president was James M. Smith, a member of the Culver Class of 1921. The set of twelve campus scenes were designed by Col. O'Callaghan, the Band director. His original pen and ink design captured the beauty of the campus and featured campus buildings, towers, ivy covered walls, and tulip beds. The border of each plate featured the Great Seal and seven small views of the campus. The center design included the Mess Hall Tower, the Memorial Building, the Logansport Gate, the Gymnasium ('Little Gym), the Recreation Building, East, North, South, West, Argonne-Chateau-Thierry, and Main Barracks, and the Riding Hall. Written on the back is: Authorized Limited Edition, Culver Military Academy Plates, 1932, The_____, Shenango China, New Castle, Pa. With the Native American Shenango Logo. Thank you so much for looking, and I hope that you find this listing to your liking. Your item will come from a pet and smoke-free home. If you are not satisfied, please let me know and allow me the opportunity to make it right. Thank you for looking and I look forward to having your business! It is your responsibility to return the item to me in the same condition it was sent to you. 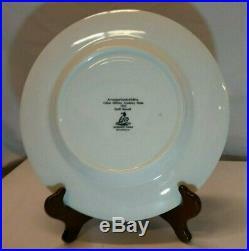 1932 Culver Military Academy SOUTH BARRACKS Shenango China Plate B" is in sale since Monday, March 25, 2019. This item is in the category "Collectibles\Historical Memorabilia\Teaching & Education\Military Academies". The seller is "certainlybenbetter" and is located in North Ridgeville, Ohio. This item can be shipped worldwide.